Clark University’s Mock Trial “A Team,” from left: Assistant Coach Rory Coursey ’13, Seth Katzman ’15, Jacob Garber ’14, Valerie Johnson ’15, Joshua Dell ’15, Sadie Hazelkorn ’15, Katie Courville ’16, and Emily Art ’17. One of Clark University’s two Mock Trial teams is moving on to the national tournament, earning its bid during the regional Intercollegiate Mock Trial Tournament held Jan. 31 – Feb. 2 at St. Anselm’s College in Manchester, N.H. The veteran “A team” will compete in the national event in Philadelphia in March. Clark entered two teams in the regional tournament, the veteran A team and the novice B team. The A team ended with a 5-3 record overall, with victories over Dartmouth College and Boston College, a loss to Brown University and a split decision with Brandeis University. The B team finished with an overall record of 2-5-1; the team lost to Tufts University and Brandeis University, split with Bowdoin College and had a win/tie with the University of New Hampshire. 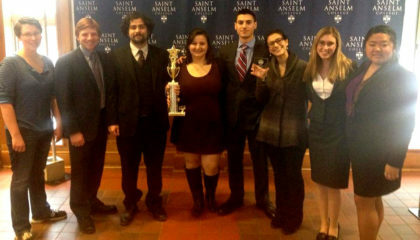 Sadie Hazelkorn ’15 was named Best Witness at the regional Intercollegiate Mock Trial Tournament. 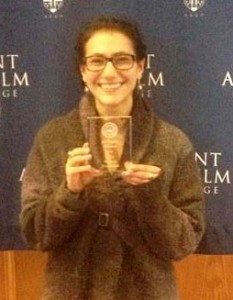 Sadie Hazelkorn ’15 of the A team won a Best Witness award at the regional tournament. In a Mock Trial competition, both attorneys and witnesses are scored. “The best witness award is one of the best birthday presents I have gotten!” Hazelkorn said, noting that the conference began on her 21st birthday. Both teams are coached by Steven C. Kennedy ’88, a practicing attorney and trial lawyer, and assistant coach Rory Coursey ’13 (who won both a Best Attorney Award and a Best Witness Award at the 2013 regional tournament). Kennedy also teaches a Trial Advocacy course in the fall semester as part of the Law and Society Program at Clark University. Members of the A team are Valerie Johnson ’15 (captain), Jacob Garber ’14 (captain), Emily Art ’17, Katie Courville ’16, Josh Dell ’15, Sadie Hazelkorn ’15 and Seth Katzman ’15. Members of the B team are Amira Farrag ’16 (captain), McKenna Hunter ’17 (captain), Kai Glick ’16, Lauren Howard ’17, Jessica MacBrough ’17, Luke Miller ’17, Brendan Simons ’15, Michael Spanos ’17, and Courtney Thomas ’17.